It is raining biopics in Bollywood, isn’t it? The year 2019 has already seen biopics being made on former PM Manmohan Singh (while he was in office), late Bal Thackeray. And now Vivek Oberoi‘s biopic on the life of Narendra Modi i.e. 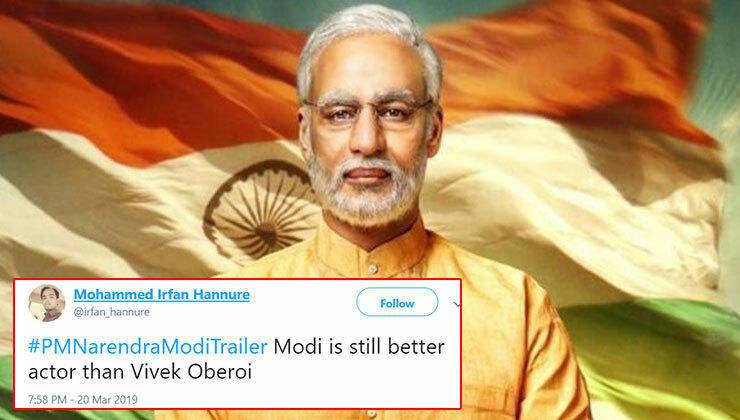 ‘PM Narendra Modi’s trailer is also out. The trailer of the film was released yesterday (March 20). Now, Twitterati could not help themselves and offered their expert opinion. Social media users especially targeted Vivek Oberoi for his portrayal of PM Modi. Vivek oberoi looked like everything..
Just saw the Narendra Modi trailer. Vivek Oberoi looks like a bad casting decision. Sure the trailer only contains snippets and you can say Iam judging early, but Vivek doesnt sound anything like anything like the current Indian PM. Vivek Oberoi as Modi is a terrible casting decision. ‘PM Narendra Modi’ is being directed by Omung Kumar. The film also stars Manoj Joshi, Boman Irani, Zareena Wahab in lead roles. ‘PM Narendra Modi’s release date has been advanced and will be hitting theatres on April 5, 2019. Stay tuned to Bollywood Bubble for all the latest news and updates.